Help identifying this tool? possible nail puller? 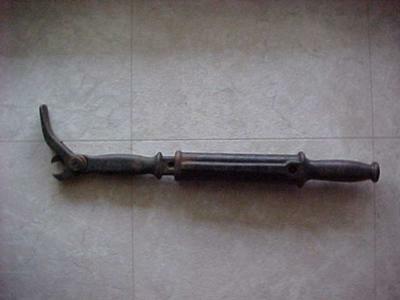 This tool is made of cast iron or steel. On the side it says "Made in U.S.A." and on the other side it says "Standard Hardware Co." The small handle by the 'claw' opens and closes the claw thingy. 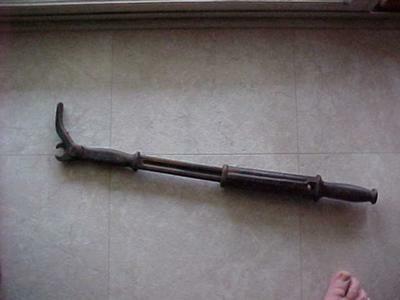 The other end has a handle that extends from 18" to about 22.5" like maybe you could use it to slam the claw into wood to grab a nail? I can't get it to do anything like that; can't figure out what it would be used for. Any help on its use or age would be great. Comments for Help identifying this tool? possible nail puller? An old time tool that's crude, but effective. Its handle incorporates a sliding weight like the one on a dent puller. Set the jaws on either side of a nail head and smack the weight against it. Impact forces the pointed jaws to dig in around the nailhead and pinch it tight. Rock the tool back onto the jaw's extended foot, and lever the nail out. Leaves a bit of a mark, but by golly it gets the job done. It's just an early version of what we call the Cooper 56 now, which is based on about 100 years of nail puller design. Check out the Nail Jack, the Paslode Eagle Claw or the Extractor for where we've gone from there.